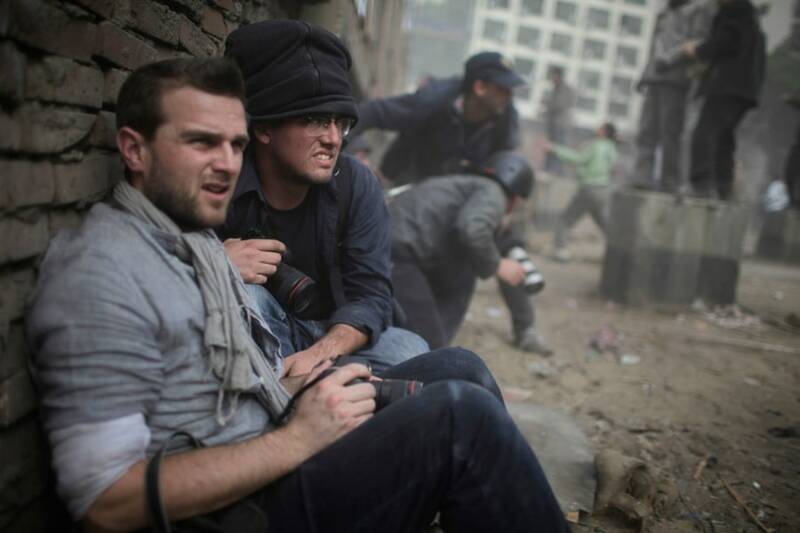 Photojournalists Guy Martin, left, and Dominic Nahr take cover behind a wall as anti- and pro-government protesters throw stones during a clash near Tahrir Square in Cairo, Feb. 3, 2011. LONDON — February 17 marks the anniversary of the Libyan uprising — a revolution that left photojournalist Guy Martin fighting for his life. The 27-year-old was in a group of photographers caught in a mortar attack in Misrata on April 20, 2011. Martin was seriously injured and two of his friends and colleagues, Tim Hetherington and Chris Hondros, were killed. Martin's life was saved by doctors who then prepared him for a perilous evacuation by boat from the besieged city. Guy Martin was badly injured while capturing the events of the Arab Spring. As Libya marks one year since the beginning of the country's uprising, Martin reflects on life on the frontline. Martin had spent several months covering the Arab Spring, documenting the historic events in Egypt and moving on to the brutal civil war in Libya. His pictures documenting the unrest in Cairo's Tahrir Square have just gone on display in London. As well as the chaotic scenes of violence, Martin prides himself on capturing the quiet, contemplative moments that give some context to the historical moments he has witnessed. "Despite the physical violence, the risk that we put ourselves in, you have a duty, a responsibility to come out of those situations with pictures, with strong images that communicate what was happening on the ground," he says. 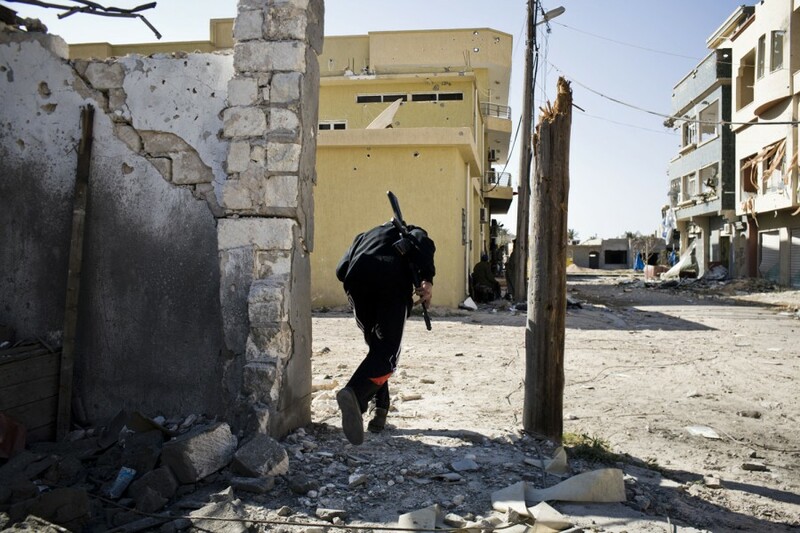 Rebel fighters moved from house to house, back street by back street to fire on Gadhafi's forces. 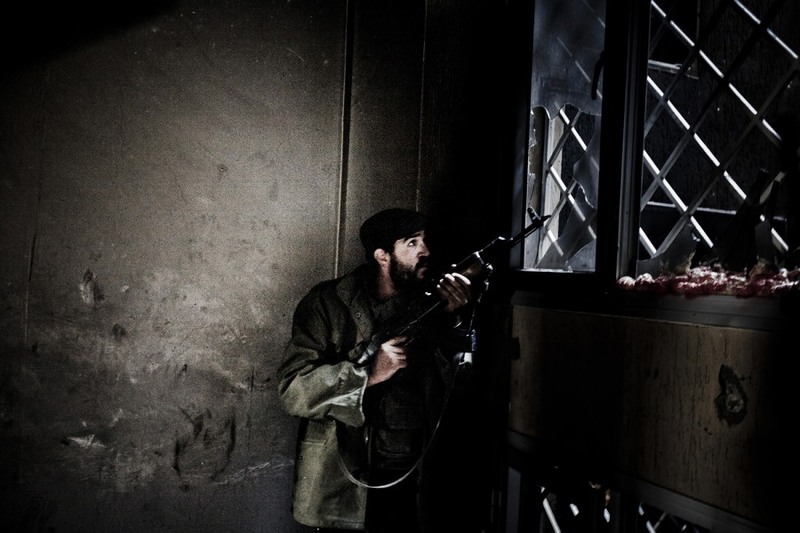 Here a rebel soldier takes cover in a stairwell as he prepares to fire on Gadhafi loyalists in the adjacent room, just a few meters away. Tripoli Street, Misrata, Libya, April 20, 2011. Rebel fighters run across an intersection that was frequently targeted by sniper fire. Misrata, April 18, 2011. 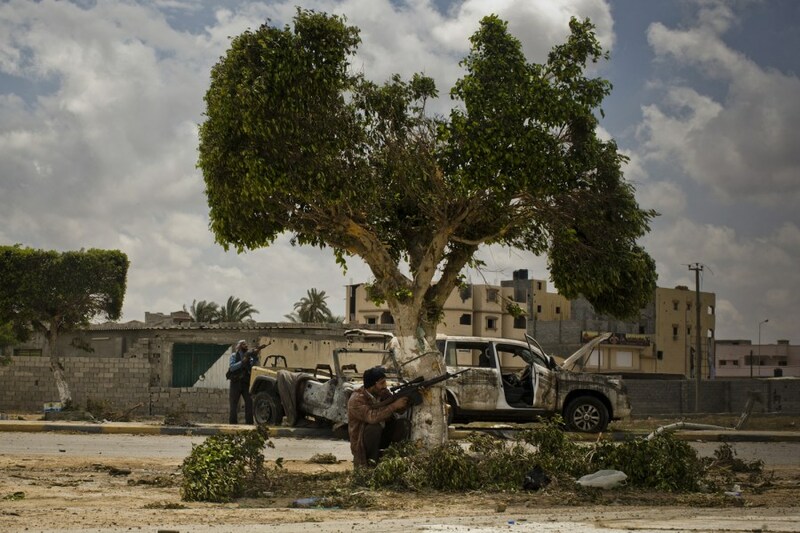 Rebel fighters takes cover behind trees on the strategically important Tripoli Street in Misrata during a fierce battle for control of the road on the morning of April 20, 2011. Hours later Guy Martin was seriously injured. The Last Days of Mubarak, an exhibition by Guy Martin and Ivor Prickett, runs at London's Foto8 gallery until March 10.